Problems with your Dental Implants? Our doctors have the expertise to provide you with dental implants that look, feel and function like natural teeth. When properly cared for, our implants can last your lifetime. 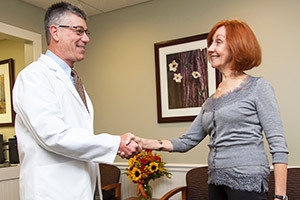 Our doctors are experienced, skilled specialists who thoroughly plan each implant procedure. As periodontists, Dr. Bakuri and Dr. Weingarden have received specialized, post-graduate training in the placement and maintenance of dental implants. Placing dental implants is a delicate procedure, and the success of any dental implant procedure relies on the skill of the doctor. Our doctors have the expertise to place implants that look, feel and function like natural teeth. Our doctors collaborate with restorative dentists, prosthodontists, and the first-class lab that skillfully fabricate your restorations. This team dynamic provides you with exceptional results. Periodontists are required to complete an additional two to three years of specialized training in periodontics following graduation from dental school. Dr. Weingarden is also certified by the American Board of Periodontology, which requires demonstrating a comprehensive mastery in placing dental implants and in all phases of diagnosing and treating periodontal disease. Board certification in periodontology is awarded to professionals who have made significant achievements beyond the required educational requirements of the specialty. Dr. Bakuri earned a Master of Science in Dentistry (MSD) from one of the most reputable programs in the country, which has given him a profound understanding of the biological mechanics of dental implant surgery. He is also currently on the faculty at Allegheny General Hospital, where he teaches dental residents about the dental implantation procedure. Have you been told you are not a candidate for dental implants? We see many patients who have become disenchanted after being turned away by other dental professionals, and we are gratified to be able to treat them the majority of the time. Dr. Weingarden’s multi-disciplinary training provides him the ability to treat complex cases, and Dr. Bakuri complements this experience with his MSD training. Many patients come to us for treatment with implants that have placed too close to other teeth, are at the wrong angle or the wrong depth. One of the biggest factors in keeping your dental implants for a lifetime is having the procedure done properly in the first place. Dental implants are intimately connected with the gums and underlying bone in your mouth, and our periodontists are experts who specialize in these areas, giving them the skill sets required to place your dental implants correctly. This will help alleviate future problems such as the “time bomb” of peri-implantitis. Additionally, our doctors use interdisciplinary training in areas such as occlusion, (the way your upper and lower teeth meet), to ensure that your implants are as comfortable and functional as they are beautiful. Learn more about how we correct problems with dental implants. Simply stated, a dental implant replaces a missing tooth root. The implant is attached to a porcelain crown (or other restoration) via an abutment. Dental implants can be used to replace a single missing tooth, several missing teeth, or all missing teeth. When you are considering receiving a dental implant, we will discuss the pros and cons with you, such as options that are easier to clean and others that are more affordable. Together, we decide on the best choice for your individual needs. A vital benefit of dental implants is that in all their applications, they help deter bone loss. We use dental implants with the following options for replacing teeth. Most dental professionals agree that the best solution for replacing a single missing tooth is with a dental implant. The implant looks, feels and functions in the same manner as a natural tooth, and helps deter bone loss. Learn more about the benefits of dental implants. Denture wearers are well acquainted with the pitfalls of loose, ill-fitting and uncomfortable dentures. Dr. Weingarden and Dr. Bakuri offer a solution for supporting your dentures and deterring bone loss through the placement of dental implants. No more adhesives, clicking, slipping or embarrassment. Our doctors can work with your dentist to embed implants that are retrofitted to your existing dentures to provide you with up to 90% of normal chewing ability. If you currently have teeth that cannot be saved, we can provide gentle extractions, followed by any needed bone or gum grafting to prepare your mouth for dental implants and an implant-supported denture. You will be provided with a set of temporary dentures so that you will never be without teeth. Learn why dentures supported by implants may be the best option for you. If you are missing all of your teeth (edentulous) or need all your teeth replaced, we can provide you with a full set of new teeth in a single day. We use our 3D CT cone beam scanner to locate areas with the best bone density and plan the details of the surgery ahead of time. We create a surgical guide for placing the implants, making the procedure precise and minimally invasive. Learn more about our procedure for New Teeth in a Day. Implant-supported bridges are flexible, stable and mimic natural teeth as closely as possible. Dental implants are used to support a series of attached porcelain crowns. Implant-supported bridges may be used when there are a series of missing teeth. They are also effective when all teeth need to be replaced, using three upper and three lower bridges to provide a full set of functioning teeth. 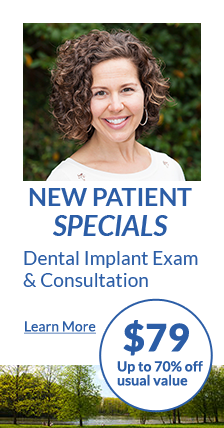 If you are considering the option of dental implants to replace missing or damaged teeth, please call us about our special online offer and schedule an appointment with Dr. Weingarden or Dr. Bakuri. Additional diagnostics as needed will be billed at usual rate. To make an appointment, call 412-201-0633 or click here to request an appointment online. Your first step toward replacing lost teeth with dental implants is a consultation with Dr. Bakuri or Dr. Weingarden. You will be able to review treatment options, have your questions answered and have any of your concerns addressed. Your doctor will conduct a thorough oral examination, checking for signs of disease and evaluating your bite (how your teeth meet), and evaluating your smile. He will also review your medical and dental history and gather any other records that may be necessary such as digital X-rays and external or intraoral photos. After you have decided that dental implants are the appropriate solution for you, our team will perform a full set of diagnostics. We begin by taking panoramic, three-dimensional views of your jawbone with our state-of-the-art cone beam scanner. 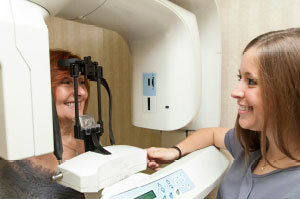 3D imaging is done for detailed implant planning. The cone beam focuses X-rays onto the precise area of treatment, and uses very low doses of radiation – 2,500 times less than a medical CT scanner. In less than a minute, the imaging system captures highly detailed 3D images that provide us with the necessary information to plan your dental implant surgery. We use 3D software to view and manipulate the images captured by the cone beam scanner. This modern imaging technology provides computerized three-dimensional visualization of the anatomy of the bone and teeth of the jaw, as well as views of vital structures such as the lower jaw nerve, the upper jaw sinuses, and adjacent teeth roots. Being able to determine the bone quality and density in the proposed implant site allows our doctors to precisely place your dental implant in a minimally invasive manner. We always pay attention to your comfort and help keep you relaxed during your visit. Our team is always concerned for your comfort during any procedure. We offer warm blankets and oral sedation in combination with compassion and reassurance. In addition, Dr. Bakuri can provide IV sedation for patients who are anxious or undergoing longer procedures. You will be in a relaxed state of “twilight sleep,” lightly dozing, but able to be woken at any time. “My experience with Dr. Weingarden and his office has been nothing but outstanding. I love how Dr. Weingarden is a perfectionist at all he does. You want that in a person working on your smile and health of your mouth. “The entire staff is so professional, with a caring, loving manner. I love them all. Who says that about a dental office?